2014 Toronto Bird Photo Booth Business Challenge is the original bird ‘selfie’ portrait contest that was made back in May 2014 to showcase custom loyalty program software through storytelling, and is not a true photo contest, but more like a friendly match between businesses hosting the booth. 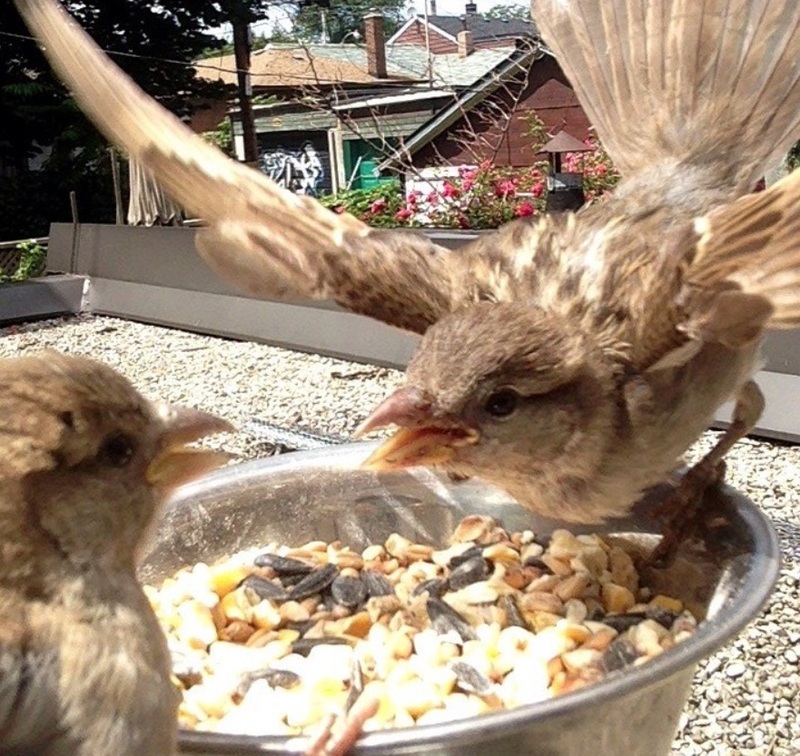 What is the Toronto Bird Photo Booth? 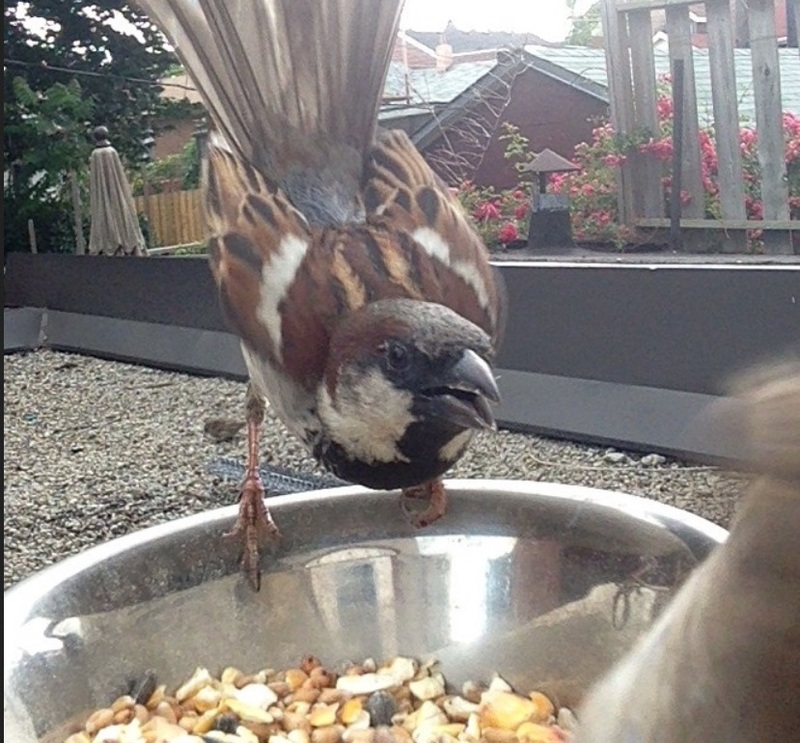 If you don’t know already, a bird photo booth is a feeder attached to a digital camera, triggered by a motion detector. Its a wonderful piece of technology that makes art to serve nature. There are two cameras here – one is an iPhone 5C purchased by John Conn of Standard Telecom, office phones service in Toronto who hosted Week Three, and the other is the WIngscapes BirdPro trail cam which is a handy back-up unit. 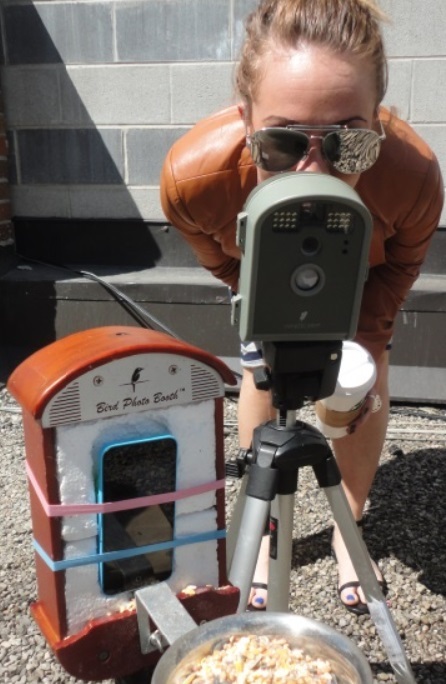 Would you like to host the Toronto Bird Photo Booth for a week on your GTA business property? 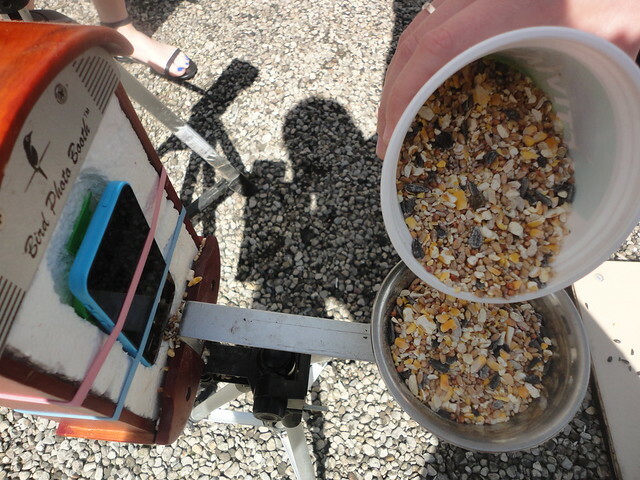 The rig is programmed to take pictures of any wild birds that land at the feeder. The idea is to see who has the best wild birds. Businesses hosting the Toronto Bird Photo Booth can enter their pics into the friendly bird portrait photo contest for prizes. SMOJoe launches Birds of Toronto, and now I chronicle developments on the blog and also write weekly Bird Photo Booth updates for Toronto is Awesome magazine. 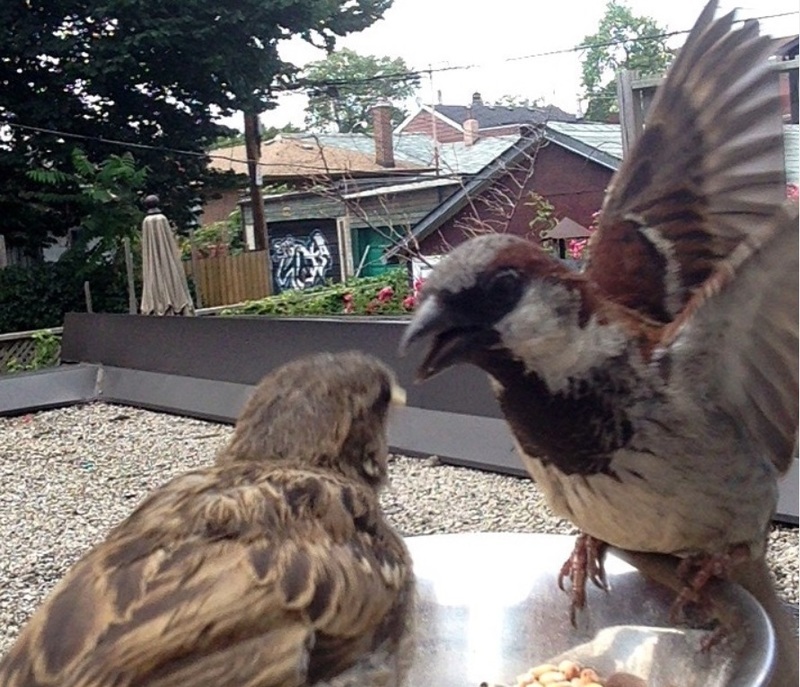 Look below at this English sparrow that thinks its a terrifying huge hawk; its emulating some larger bird of prey as it tries to scare away another fellow from the feeder. Like any playground, It isn’t long before an even meaner House sparrow with a distinctive white stripe on his wings appears to scare everyone away for a spell. You’ve never seen these tiny birds up close like this! I’ve gained a new appreciation for these sparrows by seeing them so close and full of emotion, and I imagine these birds are reacting the same way humans would fight over a big pile of cash left in the street. These birds really do have lots of have personality ! See again how white stripes simply refuses to share the bowl. This storytelling started back in June and the photography is getting better each week. Mario Beaudoin drove in from rural Quebec, to paint the interpretation of Balzacs Coffee House at right. The Distillery District’s red brick buildings and cobblestones make the Sept long weekend Artfest truly memorable for the artists and visitors that attend the annual festival. This really is a one of a kind art show in the oldest and most historic region of Toronto which is filled with sophisticated tenants, artisans, and patrons. 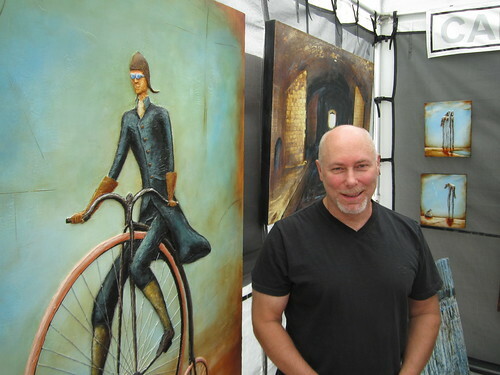 The Distillery District and Artfest in particular is a great place to exhibit art and get feedback as well as healthy sales. This is a place to network with busy interior decorators, buyers, and curators of all descriptions who saunter through the grounds over the course of the four day long weekend. Two more high rise condominiums are still unfinished behind the Victorian age slate tiles Toronto roof of the buildings that border the cobblestone courtyards. Every year at Artfest, there’s a charismatic young painter named Christian Aldo who uses glue and denim and buckets of acyclic paint to make three dimensional figures crime alive inside the frame. 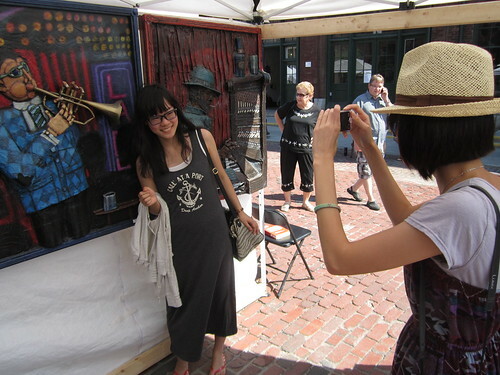 Korean girls travel to Artfest Ontario 2012 and share memories against Christian Aldo art work. For almost a decade Pikto has been at the center of photography art in Canada. The store is filled with skilled professionals who have been helping artists prepare for fancy wine and cheese style art shows with professional photo printing and photography mounting and picture framing and picture hanging services. Pikto probably best known for its custom photo books which are easy to make and present artists with a very compelling presentation mediums. Andre announced that Pikto is having a contest and the Distillery District Blog has a write up about the event. 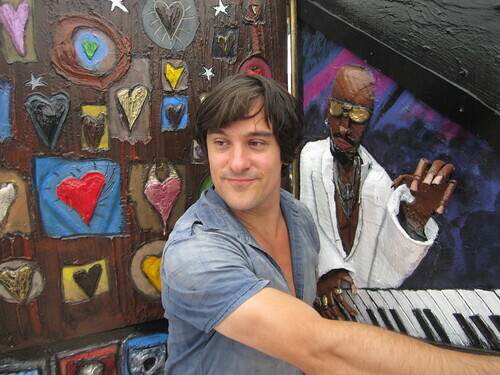 If you win the contest, you will get your own art show at Pikto, for two months. Pikto Top Pick photo contest asks three judges to gauge at all submissions and decide whose work should hanging in the Pikto gallery in Toronto for the two months. The Pikto Top Pick photo contest has no entry fee. The deadline to submit your work is November 1, 2012 at midnight. Every submission should include fifteen examples of photography intended for exhibition. And of course that material should be electronically prepared and viewable The images should be .jpg (1024×768 pixels maximum image size) and all applicants are advised to use a consistent naming system as well as number all images (e.g. 01Smith.jpg, 02Smith.jpg). 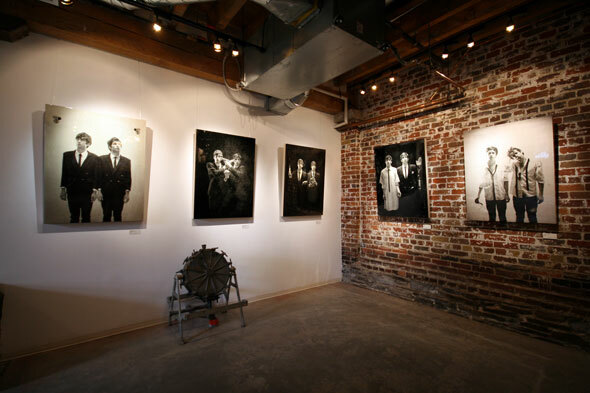 Here is the gallery where the winner’s artwork will be displayed. Lenzr.com has been quietly revolutionizing the concept of online storytelling for the past two years through its serial photo contests. Now, as of June 1, 2011, Lenzr.com has an updated website featuring new technology so compelling it’s possible that photo contests may be the next big thing in terms of online marketing. It’s still essentially the same great site: budding photographers compete with each other, upload photos to the sponsored contests, persuade their friends and family to vote on their work and vie for real prizes whilst participating in a competitive, but also encouraging, photography community. What the new site offers that the old Lenzr.com never had are ‘Community Contests’. These contests can be set up by anyone (an individual, business or organization) at any time, to show (not tell) the world about a story topic of their choice. In addition to these exciting new changes, Lenzr.com has just launched four new sponsored contests, for prizes of laptops and digital cameras! The Construction Sights photo contest is hoping to receive submissions illustrating a necessary summer protocol in the city: Construction. Like the glass analogy, there are two ways of looking at construction sites–positive or negative. On one hand, it’s hot, there’s dust flying around, and your bus has been detoured thanks to another construction delay. On the other hand, roads are being improved, housing is being created and many people are busily employed with construction work. There are two sides to this story–show us how you feel about the Construction Sights in your area and win! 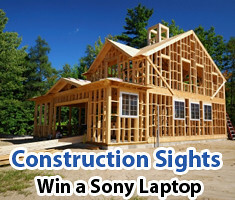 The prize is a Sony laptop, courtesy of this contest’s sponsor, a family-owned Ottawa roofing company. The Best Office Staff Party is looking to see submissions that juxtapose a stuffy office environment with a rollicking good time. How does your office let loose? Mini cupcakes? Interns working the ‘bar’? Who’s the life of the party–your boss? 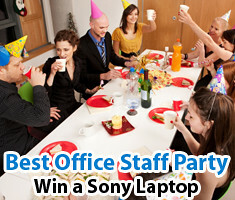 Show us your hilarious office party moments and don’t forget to include a sentence or two to put the photo in context. Also, while we want to see shots of people having a great time, make sure your co-workers are OK with your entry before submitting it–we are not responsible for any trouble you might cause! The prize is a Sony laptop, thanks to an incredible IT staffing agency located in downtown Toronto. 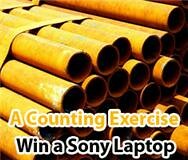 The A Counting Exercise photo contest is looking for submissions featuring a repeating visual pattern to be counted. Tap into your inner Count von Count and take a look at the world from an arithmomaniac’s perspective: sure, those may be faces in a crowd, lines on the highway or a handful of pretzel sticks, but they’re counting exercises, too! Get creative with this one–this contest has received a lot of entries already featuring many amusing counting exercises. Show your never-ending profile in a three-way mirror, the Lego pieces your kids left all over the floor or a parking lot full of bicycles in a progressive European country–give the Lenzr judges something to count and you could win! The prize is a Sony laptop, courtesy of this contest’s sponsor, a team of North York accountants. Finally, the Shafts of Sunlight photo contest is looking to see tangible lines of natural sunlight in the submissions. There is somethi ng divine about the way light can take on the appearance of matter–observe in the picture to the right–these shafts of sunlight look almost like monkey bars sent down from the heavens. Try to capture a similar effect in your photo. This is the most specific contest; the rules state very clearly that shafts of sunlight, not other light tricks, are the desired outcome. Snap the most spectacular shaft of sunlight and you may win! The prize is a Sony Cyber-Shot digital camera, courtesy of the contest’s sponsor, fittingly, a sunrooms installer. I walk past the bone chilling painting on the right quite often, yet I still cant remember the artist’s name… I dont look. Does anyone out there know? pls leave in comments. When I think of Broken Factories, this is what I imagine. This image has planted itself in my mind’s eye. This decrepit stairway in an old homestead is a dreamlike vision of squalor. It serves to remind me how far I’ve come in my own journey toward organizing a productive life and being a better citizen contributing more and more thought provoking rich media dissecting the living conditions of the human race. 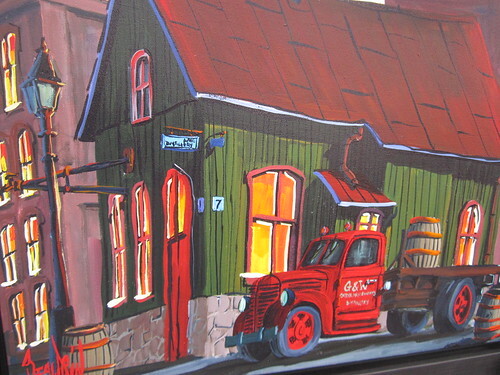 This fine art painting can be found hanging on a wall somewhere in the distillery… do you know where? Read Daily Distillery for more details. Broken Factories is a photo contest on Lenzr that reflects Rudolf Arnheim’s idea of man-made elements always moving toward equilibrium which in the case of abandon industrial centers is the presence of rust and decay being the first stages of a return to nature. Photographers and painters, image makers in general have a theory about entropy and so make action pictures out of static shots – cant you just see the paint peeling around that old staircase above? and can we use this ideological concept to suggest that static shots of crumbling manufacturing complexes and warehouses with broken windows and vandals are actually part of a larger more wholesome process of decay which in itself is the physics of life reorganizing its component parts into a wide spread chaos, which is be default its most effective layout, as per the laws of nature. Submit your best photos of abandon industrial centers for your chance to win a Toshiba NB100 Netbook courtesy of an erp software company that specializes in making high quality command management systems to better organize business initiatives. WHAT IS BEAUTY? That’s the questions, posed by a famous beauty school; artists and designers are not the only people who make this world more beautiful. Making it Beautiful is a photo challenge that pays tribute to people who make the world more tolerable, and so we’re talking about someone who creates or restores a cherished item or place. This contest allows mondo creative freedom, so think outside the confines of your everyday reality and try to image someone making something spectacularly beautiful, so pretty it cant help become the most popular choice for voters on the December 20th voting session. 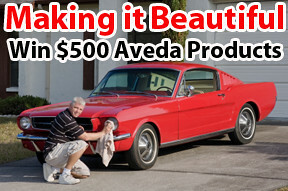 Submit your best photos of people making things beautiful for your chance to win $500 worth of luxurious hair products from Aveda, a company that has beauty schools across the country. Remember it doesn’t have to show a person’s face; a hand can be enough to get the message across. Canadian Beaches our nation’s photographers will upload their best shots of the seascapes and sunny destinations all across the country. Let’s see Mercury Beach in Saskatchewan or Dynamite Beach in PEI. Have you ever been to Falcon Beach in Manitoba? Do you have any pictures? 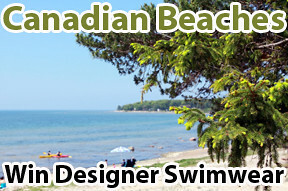 Have you ever been to Wasaga Beach on a long weekend in the summer. Its a very popular destination. Submit your snaps for a chance to win three bathing suits from a Canadian designer swimwear company that makes fun, flirty vintage-inspired swim apparel that compliments a whole range of different body types and comes in a wide assortment of colours. Note from the sponsors, when entering your photos in this contest, be sure to include the beach NAME and LOCATION in your submission. The contest closes Jan. 1st, 2011 and voting begins December 20th. Good luck! Two more Lenzr photo contests: win great prizes! Along with the three iPad photo contests Lenzr is hosting for October/November, there are two more worth checking out that also have great prizes. All the contests close on December 1, 2010. The Water on Skin photo contest celebrates the difficult-to-obtain image of crisp water streaming off body parts or being scooped up by bare hands. This image is coveted because it evokes health, wellness and beauty. Submit your best shots (no inappropriate images, please!) for a chance to win $500 worth of products from a natural skin care company called Soya Boutique. All the company’s products are made with organic and GMO-free ingredients and are luxurious without being wasteful or harmful to the environment. Seeing a pet bundled in a winter coat is enough to put a smile on most people’s faces, so Lenzr is celebrating the upcoming season with a Pets in Winter Coats photo contest. Take your best shots and submit them to Lenzr by December 1st for a chance to win a snow blower courtesy of a snow removal company servicing southwestern Ontario. The SnowMen serves both residential and commercial properties and work around the clock to ensure a snow-free drive. Voting begins November 20th for both contests and all of them are open to residents of Canada age 13 and older (not valid in Quebec). Following the success of last month’s contests, Lenzr just started five new contests for October/November, three of them with iPads as prizes. All the contests close Dec. 1, 2010. The Backyard Critters photo contes t is looking for the best shots of the animals you see out your back door. Do you have a family of pesky squirrels that try to steal birdseed? Or deer that stop by for a morning graze? Whatever creature you see playing in your backyard, Lenzr wants to see it, too. This contest is sponsored by a metal roof company that specializes in keeping houses protected from the elements. The Concrete Ideas contest celebrates how this amazing building material — one of the oldest around — contributes to the urban landscape. From buildings to bridges, concrete doesn’t have to be an eyesore. Use your imagination to shoot the concrete at interesting angles and show how it can be a piece of art. Sponsored by a company that specializes in insulated concrete forms, which help reduce energy consumption and emissions. The Colourful Houses contest wants your shots of bright buildings you’ve seen in your neighbourhood or on your travels. These are the houses that get people talking because they’re out of the cookie-cutter norm. Show us the best colourful houses you’ve seen for your chance to win. Contest sponsored by a PVC trim company, which offers a cost-effective alternative to wood trim. Voting on these contests starts November 20, 2010. In all three contests, the registered member that uploads the highest ranked photo will WIN AN IPAD when the contest ends on Dec. 1, 2010. Contest open to Canadians 13 years of age and older, but unfortunately it’s not valid Quebec. The solar power industry now employs almost a hundred thousand people in Canada, and is rapidly expanding all over the world. Canadians import components from USA, Netherlands, Germany and Japan and China. In most cases the pieces are assembled in Canada, and some notable advances in the applications of solar power and batteries are exclusively Canadian. In the months of August and September 2010, Lenzr can count itself among those employed in the rapidly expanding solar power sector in Canada. Three new contests are actively marketing solar power production and promoting solar energy to consumers. The View From The Roof photo contest endeavours to collect the strange and wonderful scenery that’s ofetn only visible from rooftop, and consequently seldom seen by people who dont rise to the challenge. The sponsor of this challenge is a industrial roof repair expert who specializes in installing white roofs for solar power production. This contest shall collect the views from properties all across Canada. More details at the end, and on the Lenzr blog, All Weather Roofing Asks for your View From The Roof, win an iPad. The Morning Sunshine photo contest on Lenzr is all about capturing and using solar power, in photography. Participants are expected to use their cameras to capture people and objects in the early morning sunshine. Solarline Power assembles portable solar power generators (PSG’s) that quietly collect deliver clean renewable energy to eco friendly habitats and construction sites, outdoor events and film productions. Solarline Power makes and sell a mobile work unit that has on its top surface a giant adjustable solar panel that can be programmed tofollow the sun. below there are work stations that can be custimized to suit any business These units charge batteries that can replace small engines as a power source for many new eco conscious outdoor events and construction sites . rimary objective is to help you create a backyard paradise. People Building Things photo contest is also related to the solar power industry, and not just because the sponsor is an eco friendly solar powered deck building company. Construction sites a more interesting when they happen at home, show us people building cool things in the basement, driveway, garage or backyard. Submit pics of People Building Things and tell us the story behind the picture. Be sure and mention what’s being put together. In all three challenges, voting begins September 20th, the highest ranked photo will automatically Win an Apple iPad prize when all three web challenges end October 1st 2010. Must be 13yrs old or older to enter, open to all Canadians. Contest not valid in Quebec.